In the early years of our infatuation with Grower Champagne this small grower (production about 3000 cases) gave us some of the most distinctive Champagnes we had ever tasted. Firmly committed to committed to biodynamic viticulture, his wines showed an "aliveness" that, even in their absence over the past several years I remembered. The most recent bottle a Blanc de Argile drunk in New York last September was astonishing so when I heard a few months back that the wines would be available in Seattle once again I counted the days until they arrived. And finally they have. For those of you who like to geek out a bit, here are words from one of the worlds' foremost Champagne geek, Peter Liem, that goes into a bit more depth. "The champagnes of Vouette et Sorbée are uncompromisingly original, possessing deep, vinous aromas and assertive personalities, and their intensity of character makes them more suitable to contemplative drinking or to accompanying food than to casual sipping. They are clearly the products of a natural philosophy of viticulture, with all that that implies in the French wine world, and while this may put some tasters off, those wine aficionados who enjoy the wines of other natural growers in France such as Emmanuel Houillon, Marcel Lapierre or Claude Courtois will find an affinity here. These are not champagnes that will please everyone, but there is not enough quantity to go around anyway, and those of us who do appreciate Gautherot's wines will seek them out wherever and whenever possible. 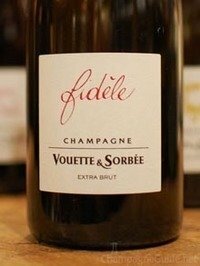 The primary wine of the estate is a blanc de noirs called Fidèle, made entirely of pinot noir and almost exclusively from Kimmeridgian soils in Biaunes and Vouette. It's largely composed of a single year, with just three to seven percent of reserve wine, stored in a large oak foudre and composed of a perpetual blend started in 2001. In 2004, Gautherot began bottling a pure chardonnay called Blanc d'Argile, from the Biaunes vineyard. The vines here are young, having been planted in 2000, and unlike Vouette, which faces south, Biaunes has a western exposure, meaning that the grapes take a long time to ripen. Yields tend to be very low (a mere 15 hl/ha in 2004, resulting in only 1,100 bottles being produced), as Gautherot prunes the chardonnay here to only five bunches per vine, and this is well-reflected in the ample, mouth-filling character of this wine."